I received this from Headline/Bookbridgr in exchange for an honest review. As always, my reviews are fair and non-bias. The Proposal is quite different from your ordinary tale. It's set in two different times; 1958 and 2012, centered around Amy and Georgia, the two lead characters of the novel. Amy in 2012, had a dream to come to London to become a dancer, a dream that had many obstacles on the way. She worked in a restaurant to pay rent, but still longed for her big break. But suddenly the future she wanted is no longer written in the stars and she feels thrown back to square one. Longing to see her family back in New York, she stumbles across an Ad looking for a companion to the Big Apple and she becomes more determined than ever to see her family. Georgia in 1958, was quite similar to Amy in a lot of ways. At 18, her whole life changed. In 1950's London, it was the place to be with the debutante season and eligible men. Looking for a husband should be at the top of Georgia's list but she is very different to the other girls. Fancy parties and men were not on her radar at all. So when a tragic event happens, she is even more uncertain about her future. But now, both Amy and Georgia's futures were uncertain with the tragic times of ending relationships and bright futures ahead, leading to the start of a bittersweet story that would span more than fifty years in time. 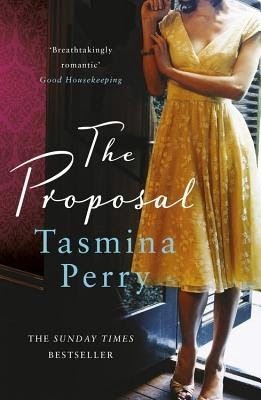 The Proposal was an amazing story of friendship, family, love and lies...and New York. It's a breathtaking, unique novel that sparkles in it's own right. Incredible. The parts with Georgia back in the 1950's were my favourite parts - there was just something about her story that intrigued me more than Amy's and I loved the originality of it all. It's an incomparable book by far. Adult Fiction readers, along with Romance and Contemporary readers! Have you read The Proposal? Tell me in the comments, on twitter or by using the hashtag #TheProposal happy reading!